Could Aluminum, Barium and Other Substances From Stratospheric Aerosol Geo-Engineering Programs be Destroying Eco-Systems around the World? 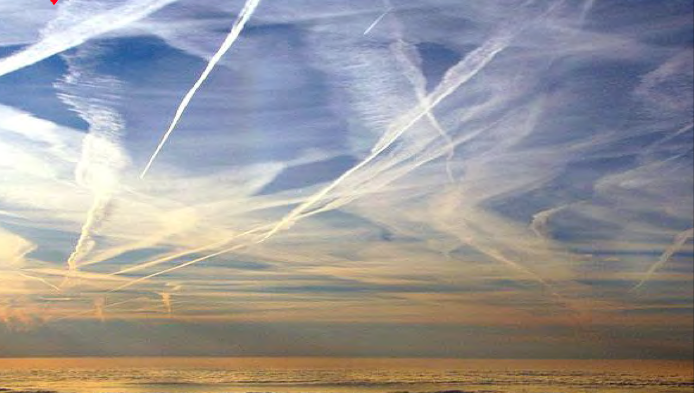 The AAAS meeting hosted several top geo-engineering scientists who gathered to discuss the “plausibility” of implementing various geo-engineering programs throughout the world. One of the options addressed was the stratospheric aerosol geo-engineering (SAG) , AKA chemtrail program, where scientists discussed the “plausibility” of spraying aerosol aluminum, barium and other particles into the sky to block the sun as a means to “reduce” the Earth’s temperature. When asked specifically about the potential risks associated with using aluminum in the program as an aerosol, scientists replied by stating that they have not studied much about the risks associated with aluminum and added that something terrible could be found tomorrow that they haven’t looked at. When probed further about the deployment of existing aerosol programs, the scientists stated that no aerosol spraying programs have been deployed to date. The concerned citizens I met outside the meeting were claiming quite the opposite. They came in protest after witnessing airplanes that they believe are regularly spraying aerosols into the upper-part of the sky. Many from this group have tested and found extremely high levels of aluminum, barium and other substances in their soil, rain, water and snow. Ironically, the substances that they reported finding are the same substances the scientists are “considering” implementing in the various aerosol spraying programs discussed at the meeting. They also believe that these substances are leading to the destruction of eco-systems and are coming from already deployed SAG programs. Due to the severity of this issue and my desire to know the truth, I was led to Shasta County in the Northern part of California to investigate not only the claims of what is being reported in the sky, but also claims of what is in the rain, water, snow and soil from what many residents are saying is the result of SAG programs. The first stop on this trip led me to Dane Wigington’s beautiful 2000 acre property overlooking Lake Shasta. As we toured his breath-taking land, he pointed to multiple trails that blanketed the sky. He claimed the trails are present on most days above Northern California. Wigington referred to this as a “moderate spraying day”. Like many other residents in Shasta County, Wigington moved to the area to get away from the heavy pollution of Southern California that he grew up with as a child. His dreams of living off the land and becoming one with nature are now coming to a grinding halt as he is focusing his time and energy on the issue of geo-engineering. Wigington became concerned about SAG when he began to notice dramatic changes in the solar power that he uses to supply his home and property. Owner of one of the largest residential solar systems in Northern California, he began to notice very high declines in solar power. It can be decreased by as much as 60 percent on what he calls “heavy spraying days”. Wigington said, “The trails are literally blocking the sun”. He also went on to say that he regularly samples the fine dust layers on top of his solar panels and other outdoor surface areas and frequently finds very high levels of aluminum and barium. Wigington believes that these are a product of SAG programs. When asked what these changes can do to the ecosystem, Wigington replied by saying that it is devastating. He went on to say, “if this continues, we can only expect to see things get much worse. Not only are we seeing our trees dying here, but also a major decline in our wildlife and fish”. As a matter of fact, Wigington stated that according to The National Oceanic Atmospheric Administration, the salmon run, once seen in abundance in this area has declined from 769,868 in 2002 to 39,530 in 2009. That is over a 90 percent decline. Amazingly enough, this decline started occurring about the same period of time when residents began to see a dramatic increase in what they believe to be SAG programs. Wigington’s efforts to get these issues and test results addressed has been largely ignored by government agencies and officials. After a closer look at Wigington’s property, my initial awe of the beauty and breath taking views led to sadness, frustration and anger over the contamination that is literally destroying the eco-system. This led me to investigate further by seeking an expert in biology. I packed up the car and headed north to the breathtaking town of Mt. Shasta. Mt. Shasta has been known for its beauty, clean air and as being the source of water for some bottled water companies. Many travel from around the world to mountain climb and vacation in this beautiful part of Western America. Francis Mangels, BS in Forestry, Masters in zoology and a retired soil conservationist and wildlife biologist who worked for the U.S. Forest Service for over thirty five years, welcomed me into his beautiful home in the town of Mt. Shasta to discuss the “hidden” crisis that is occurring. Mangels alerted me to the rapid decline of fish in the nearby rivers and streams. Mangels brought me to a nearby creek that had an abundant supply of fish just a few years ago. Because the primary diet of the fish in the creek is aquatic insects, he performed a standard sample method to measure the amount of insects present. The samples he had performed before the alleged aerosol spraying campaign had yielded an average of 1000aquatic insects. Our sample yielded only 31. This is over a 96% decline from samples taken just a few years ago. Mangels stated that because the fish live off of the insects, they are literally starving. This rapid decline is likely due to changes in the chemistry of the water. The only changes that Mangels is aware of are the dramatic increases of aluminum, barium and strontium which he believes is from SAG programs. We also took time to test the pH of nearby soil and snow which contained over 10 times the alkalinity of the normal pH. Mangels has evidence that this drastic change in pH is also due to the massive increases of aluminum. He stated that forests, fields and farm ecologies thrive in acidic soils. Aluminum acts as a buffer that increases alkalinity and can decimate ecologies in large amounts. Mangels also pointed out that snow on Mt. Shasta was tested and sent to the Environmental Protection Agency (E.P.A.) who found results that contained 61,100 ug/l or parts per billion of aluminum and 83 ug/l of barium. The normal amount of aluminum in the snow at Mt. Shasta is 0.5 ug/l. Drinking water allowable is 50ug/l. That means that the snow on Mt. Shasta has tested at 1200 times more poisonous than water standards allow for aluminum. Mangels said, “Mountain climbers that come from around the world are drinking the poisonous water from the snow on the mountain”. Mangels went on to say that government action is required at just 1000 ug/l of detected aluminum. Although he alerted several government agencies of these findings, no governmental action has been taken to date. What is amazing is that these tests and many others throughout the world are largely being ignored by the very governmental entities that are required to address them. Some politicians, like Mt. Shasta City Council member Ed Valenzuela may choose to ignore the issue. Valenzuela was made aware of the mass contamination at a city council meeting where he stated that the city did not want to sample the water for aluminum because the request was a “can of worms” that would, “open a Pandora’s box” that the city would have to pay for. Although several local citizens volunteered to pay the $22.00 cost of the test at an EPA lab, both Republican Committee Chairman Russ Porterfield, and Valenzuela voted no to having the water tested. The mayor Stearns wanted the test, but was overruled by a 3-2 vote. This response is not uncommon as Mengels has presented this issue and his scientific data to over 15 local and federal agencies including Senator Feinstein and Senator Boxer’s office. To date he has received no response or action. Is it a coincidence that the substances found in the rain, snow and soil in this region and around the world match the exact substances that scientists are “considering” implementing in various geo-engineering campaigns throughout the world? If not, then why have agencies and officials largely ignored these findings that are destroying our planet’s eco-system? Could it be that officials are fearful of exposing a massive cover-up of a world-wide ecological crime? Or is it the belief that this issue is simply too large and too complicated a problem for them to tackle? Whatever the reason for this ignorance, we need to demand that our questions and shocking test results get addressed not only in Shasta County, but in every part of the world. Our future on this planet is dependent on this issue being addressed. Because this movement has come under attack from those who appear to be protecting the many political and corporate interests associated with SAG, it is essential that all of us around the world get involved by testing the rain, snow, soil and various outdoor surfaces and reporting the results to our elected officials and local environmental agencies. We must also reach out and educate all those involved with SAG who might be unaware of the environmental implications associated with their programs. Testing for pH changes and metals is simple and can be performed almost anywhere at a nominal price. Simple testing instructions and more information about geo-engineering programs can be found on the internet at www.geoengineeringwatch.org . Biologist Francis Mengels can be contacted by e-mail at bioguy0311@sbcglobal.net for more information on this issue, the tests he has performed and suggestions on testing procedures. Please take action by testing, reporting and demanding answers on this ever so important issue. Both nature and humanity depend on it. For more information, please contact me at whtagft@hotmail.com. Previous articleWhat In The World Are They Spraying?